250 word project concept including type of equipment needed and area of printmaking proficiency - silkscreen, etching, letterpress, paper lithography, paper making, book arts, etc. 2 Letters of Recommendation- these should be sent electronically to PCNJ from the individual making the recommendation. Recommendations should be made by individuals who understand the skills and professional capabilities of the individual and their ability to work within a community studio space. These MUST be received by PCNJ by the deadline of March 30th, 2017. 10 examples of work: all 200 dpi jpegs @ 8″ longest dimension. Each image must include the artist’s name, date, medium, and size. 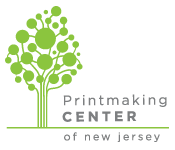 PCNJ is looking for a strong body of work, which does not need to be limited to just printmaking. * Please note all documents and information (including reference letters) and 10 images need to be received by 11:59pm, March 30. Incomplete applications will not be considered. Applications must be submitted online by 11:59pm, March 30, 2017. Selected artist will be notified by April 14, 2017. Residency period will take place for selected weeks between June 1 and September 2, 2017. ​Please be patient once hitting submit! Files may take several minutes to upload- watch progress bar in browser. Do not refresh page. Application is not submitted until 'Thank You' message appears.